Commission our artist to draw a funny and cute caricature drawing of father with son, who can sit on the hands, on the neck or in own pose which your child like to be. 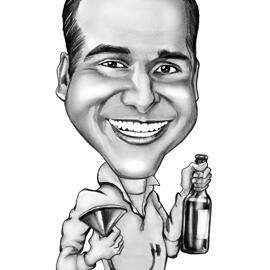 Caricature will be hand-drawn from submitted photograph in monochrome pencils style on paper. We can execute any concept of your choice, for example, you both can be depicted as football players, superheroes or just standing next to each other in simple relaxed pose. 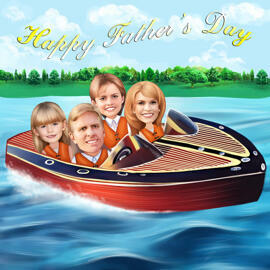 Usually, such caricatures are good gifts on Father's Day and Birthday. Caricature of 2 persons will be delivered as a ready-to-be-printed JPG File to your Email, by default. Additional delivery options at extra cost: Original Caricature Drawing, Caricature printed on Photo Paper, Caricature printed on Canvas.